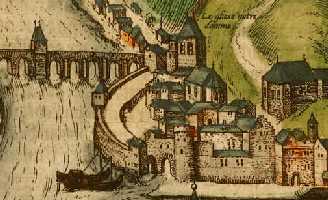 Namur, Georg Braun, Frans Hogenberg 1616? Namur Valegio Francesco, 1625 ? Located at confluence of Sambre & Meuse rivers; was pre-Roman settlement; seat of counts of Namur from 908; passed to Burgundy in 1421; its strategic location at routes into France has meant that city was often the scene of conflict in 17th & 19-20th cen.